St. Nicks Alliance has a proud history of providing quality elder care services to Medicaid-eligible Brooklyn seniors since 1980. Our 1,000 home attendants care for our 600 clients, enabling local seniors to age in place. 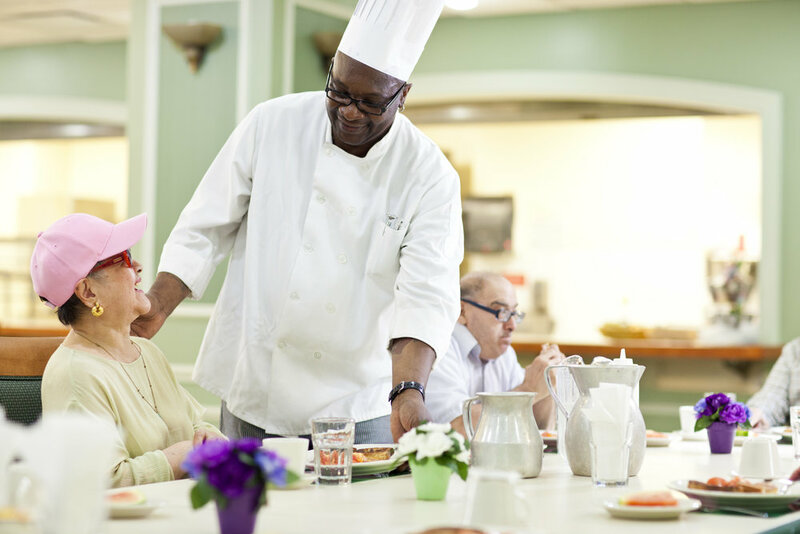 Our Assisted Living Program at Jennings Hall provides Medicaid-funded elder care services to seniors who need help with their daily activities. Residents in the ALP maintain an independent lifestyle while receiving the care necessary to help them live their lives to the fullest. We also offer social resources and housing options for seniors seeking services other than assisted living. Assisted Living at Jennings Hall is a safe, secure living option for Medicaid-eligible seniors who require help with daily activities but still want to live in their own apartment. At Jennings Hall, each senior has an apartment in a safe, secure facility with 24/7 security and the services to enable them to enjoy their golden years in their own neighborhood. The ALP is licensed by the New York State Department of Health to provide Medicaid-funded home care services to seniors who need help with their daily activities. Call the Jennings Hall desk at (718) 782-3390 ext. 221 to learn more. Our senior housing provides homes for more than 350 low-income elderly people. Most of our senior residents live in three nearby buildings: Jennings Hall, Monsignor Vetro Apartments, and Metropolitan Houses. Call 718-782-3390 for information about applications. Eligibility for services and the number of hours of service per week are determined solely by HRA. St. Nicks Alliance then provides services as authorized. St. Nicks Alliance employs more than 1,000 home attendants to care for our 600 clients. To apply for Medicaid home attendant service for yourself or someone you know, please contact us at 718-388-5654 +207 or eldercareinfo@stnicksalliance.org. We will be happy to guide you through the NYC Home Care application process. Swinging Sixties is open Monday through Friday, 8AM-4PM. Breakfast and lunch are served daily for a small fee. Membership is free. Stop in for a tour of our facility any time! Once accepted for membership, we'll need your proof of age, physician and emergency contact information, and a list of your medical conditions and medications. We look forward to your visit! St. Nicks Alliance Home Care seeks people who want to make a difference and join our skilled and caring team. Click the button below to view our Home Care Worker application.